Love the Personalized Rocket ship growth chart from Mama Hoot Designs!! From Lucy Blaire Creations i love all of the oilcloth makeup bags! Great giveaway! I like the Purple Flower Power Crochet Mary Janes! Springtime Giraffe is cute at Lucy Blaire Creations. From She’s That Girl I like the Fairy Soap Vegan Friendly Handmade Scented with Dragon Blood. Thanks. Oh Mama Hoot’s Personalized Rocket Ship Growth Chart is so cute! Thanks for the giveaway! I love the Grey and Light Pink Baby Mary Janes in the sweetheart and soles etsy! I love the Josiah’s Nest stuff the best. Unfortunately, she’s on vacation mode! love the oil cloth make up bags at lucy blaire!! I like Shes That Girl Mermaid Grotto Vegan Soap! I love the royal lion from lucy blaire! i voted for you :)!!! the giraffe pacifier clip at tmd is super cute! I like the Springtime Giraffe at Lucy Blaire Creations. MERMAID and DOLPHIN Vegan Soap with Shea Butter and Pikake Flowers Fragrance from She’s That Girl. Love the Handmade Rose Soap from She’s That Girl Soap Shop! Very elegant. I visited TMD designs, and I also love the small football clip! Mama Hoot Designs”s Rocket Ship Growth Chart is nice. I like the homemade spellbound luxurious soap. My sweet find is the Infant Sundress in Mama Hoot Designs. it is adorable! I love the Lotion Bar Body Butter with a Mango Tango Twist from She’s That girl! I like the Dolphin Dreams Vegan Soap from She’s That Girl. I love the beautiful Fairy Garden soap from ShesThatGirl. I voted for you on WotF! I voted for you on Picked Fences. I went to She’s That Girl Soap Shop and I like the Body Butter Lotion Bar with a Mango Tango Twist. I voted for you on Picket Fences blog. I follow you on Twitter as @BookOwner. She’s That Girl has so many gorgeous soaps that it is really hard to choose one. But I think that the Fairy Garden soap is my favorite. I love the Mermaid and Dolphin Vegan Soap the most – it is so pretty and would look great in a guest bathroom! I visited LucyBlaire Creations since my daughter is now into stuffed animals. I love the Baby Stripe Hippo…sweet! I like Lucy Blair’s Large Oilcloth makeup bag. 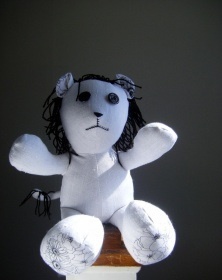 I love Lucy Blaire’s plush animals – they are absolutely adorable! TMD has a super cute owl paci clip!!! They all have fantastic stuff, wow! I love the Personalized Rocket Ship Growth Chart from Mama Hoot Designs. What a fab idea! at momma hoots i found the cutteeee personalized rocket all i can say is thats adorable! I love the Purple Flower Power Crochet Mary Janes! mama hoot designs- i love the rocket ship growth chart- so cute! The Dolphin and Mermaid soap is unreal!! And that cupcake looks yummy enough to eat! i love the baby stripe hippo at lucy blair creations. I love the oilcloth make up bags.. totally cute!! 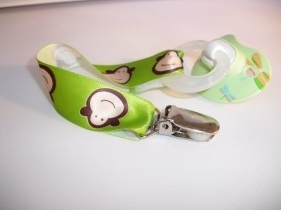 PMD Design – Pacifier Clip – Giraffe. How cute is that! I voted for you on We’re on the Fence. The mermaid grotto soap from Shes that girl are adorable!!! I like the Soap Handmade Pikake Flowers Buddha Vegan. I’d love to try the soap! I found the Pacifier Clip- Owl on TMDdesign Etsy shop. It is super cute! I follow you on Twitter. My screen name is laprochaine. I like the zipper top canvas handbags. There are several designs. Love the necklace, would love to see more, but she is on vaca! The Pacifier Clip-Strawberry from TMD designs is adorable. I love the halloween bootiful shoes from sweetheart and soles. from lucy blaire i like her baby stripe hippo. I like the bewitched black cat soap on She’s that girl’s etsy site. I voted for you on we’re on a fence. WOW! I just loved visiting the sites and enjoyed browsing through them since I had never been to them before! Thanks for the cool giveaways. I love the candycorn crocheted shoes! The handmade rose soaps from shesthatgirl are so cute! The hand rose soap is very awesome. The Spring Time Giraffe from LucyBlaireCreations’ shop is really cute. I love those crocheted baby shoes!! The sundress on Mama Hoot is so cute! I like the handmade rose soap from Shes That Girl, lovely, almost too pretty to use! I love the candy corn shoes on SweetHeart and Soles shop. cute! I love the soaps from Shes that Girl..the rose shaped soaps and love the cupcake soaps!! 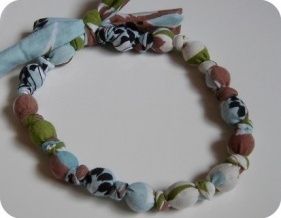 I love the Solid Moss Green Cloth Necklace from Josiah’s Nest, very original and fun! love love love the set of 3 onesies from mama hoots – and the fact that the 3rd shirt can be monogrammed! I also like the Manatee soaps! the mermaid in the grotto vegan soap is SO cute from shesthat girl! so intricate and detailed! tmd’s pacifier clips are so cute! im quite partial to the pink butterflies, but can just see my little diva rockin the zebra stripe! lucy blairs stuffed animals are SO cute! i love the fact that they come in a variety of designs.. the hippos are my favorite! ahh! the maryjanes from sweethearts and soles are ADORABLE! its cute how shes incorporated fall/halloween into the color designs… but classic maryjanes just do it for me! i vote every day for your blog.. today is no different! count me in! by the way.. youre amazing! love you! Love the Mermaid Rose Soap Pikake Flowers Fragrance Vegan from “She’s that Girl”! Sweet Hearts and Soles has some pretty purple baby Mary Janes; purple is my fav color. I found this sundress, isn’t it adorable?! fairy garden vegan soap is adorably precious from she’s the girl! Great giveaway! I love the Mermaid Grotto Vegan Soap from Shes that girl. I like the Royal Lion at Lucy Blaire Creations. I love the candy corn shoes on Sweet Hearts and Soles etsy site! Great for fall! I like the Personalized Rocket Ship Growth Chart from Mama Hoot Designs! I LOVE The Handmade Rose Soap from She’s That Girl! I love the Infant Sundress – Little Dresses for Africa at Mama Hoot! Sweet Hearts little Pink and White Sporty Baby Sandals are just too cute! I love these: Colorful Autumn Candy Corn shoes from SweetHearts and Soles! I might have to buy a pair! Following you on twitter as @meltnw! I love the Diaper Bag Oversize Car Kit on MamaHoot. I also love the Warm Brown Pumpkin Patch shoes from SweetHeartsandSoles. Thanks for the chance to win a sweet prize package! I like the Warm Brown Pumpkin Patch – too cute! Love the oilcloth makeup bags at Lucy Blaire! 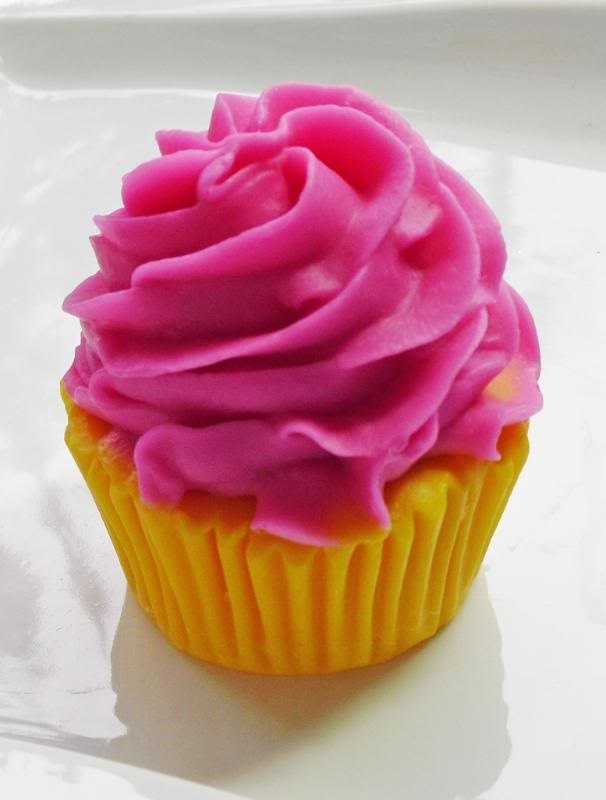 The cupcake soap is so cute! It comes in Lemon too! I like the baby bags that Etsy offers; they are pretty. omg! candy corn shoes in the sweetheart and soles shop! they’re sooo cute! Momma Hoot Tees are so cute. I don’t know how I would ever choose. Canvas Handbag – Toile Gray from LucyBlaire and the vegan cupcake soap. i currently follow moriah on josiah’s nest & i love her necklaces!! and her baby is cute, too! Love the dolphin soap that She’s That Girl sells. Thanks! I follow you on Twitter (@MaritimeMom). Thanks! She’s That Girl is an awesome shop. All the soaps are wild!!! The rose soaps are very beautiful!! I love the Mermaid Grotto Vegan Soap at shesthatgirl etsy shop! I really like the Oilcloth MakeUp Bag Medium on LuckyBlaire. I like the one with the pink, green and blue flowers. I am really digging the MERMAID and DOLPHIN Vegan Soap from She’s That Girl etsy. Thanks. I love the Vegan soaps! My favorite is the Dophin Dreams! I love the rose soaps at She’s That Girl. They would look so cute in my bathroom as guest soaps. I love the diaper bags at Mama Hoot Designs! I love mama hoot’s alphabet books! LOVE the vegan soaps, especially the cupcakes. I like the Lady Bug costume from Mamma Hoot Designs. Did you see those cute candy corn shoes at Sweet Hearts and Soles? Love the linen wristlet at Lucy Blaire! I like the pretty in pink baby mary janes from sweet hearts and soles. You have just voted for Forever & After! I so love the Shes That Girl store, its like a mini heaven to me! I lovedddd the MERMAID and DOLPHIN Vegan Soap with Shea Butter and Beach Fragrance. Its like a mini piece of art! I like the alphabet books at Mama Hoot Designs. the dolphin Vegan Soap from She’s That Girl looks really neat! baby striped hippo from LucyBlaire. Cute! Pink Camouflage Spring Daisy Cotton Baby Sandals 6-9 Months from Sweetheart and Soles. The personalized birthday shirts on Mama Hoot are very cute! From She’s that Girl, I love the Handmade Rose SOaps. i love the Summer Sunflower Red Baby Mary Janes from the sweet heart and soles etsy shop! i love the Mermaid Rose Soap Pikake Flowers Fragrance! Oh wow! Those crochet baby shoes are just too much! Might have to get those red ones for my niece! I love the cute Hippo stuffed animal at Lucy Blaire Creations! I like the Chocolate Brown and Pink Baby Mary Janes at SweetHearts and Soles. The colorful candy corn shoes are adorable from sweet hearts and soles!